Wow, I’m so pleased to finally introduce you to my newest Lisette pattern, Lisette B6661 for Butterick! It’s something I’ve been working on for a long time now, mostly because I’ve been trying to decide the best way to develop it. I’ll tell you a little bit about it and why it took so long to work out the details. I’ve been thinking about sundresses for a few years, loving the idea of criss-crossed straps and playing with stripes in the princess seams. Princess seams are so helpful for letting you get a good fit, but they can also be used to get a chevron effect when you’re working with stripes, so that’s an added benefit of this style. But the style details of a sundress like this can be tricky for anyone who needs to wear a bra. Which is probably most of us, right? I had a sundress sort of like this when I was in high school, and my mom made me wear a shirt under it because the sides were too open. (So funny, now S would be the one to make me wear something under it!) This design, however, actually shows only a little skin even though it gives the effect of being breezy and open and carefree. So, in effect, it actually is carefree because you don’t need to worry about showing too much–or more than you intended to show. The open back is quite deceptive, actually. A couple of summers ago we were visiting friends in Barcelona, and we were talking about sundresses while walking around, people watching. I mentioned that I was thinking about this style and my concerns about not being able to wear a bra with it. I told them I was thinking about adding a shelf bra to the construction, and after a little discussion about how it would work we agreed that it would be helpful. A shelf bra might not sound like enough support, especially if you’re full busted. But hear me out: First of all, you might be surprised about the amount of coverage in this style because of the way the straps get wider as they reach the sides of the dress. Plus, remember that you can always add cup liners to a shelf bra, much like with swimwear. In fact, we had a long discussion about this when I stopped in at the Butterick offices for a development meeting this past summer. (That’s when we review the details, discuss which fabrics to use for the photos, etc. ) Between the wide straps and the shelf bra with cups, I think you’ll feel surprisingly secure and legitimately carefree in this style. The skirt comes in two lengths (of course you can sew it any length you want, but it’s all ready for you in two different lengths when you open the pattern), and I think this sundress will look great in solid-colored fabrics as well. In fact, I’ve got some salmon-colored linen waiting for my copy of the pattern to arrive one of these days. But first I have to finish some of the other things that have been waiting for me to sew them. And it will take a while to get through customs anyway. I think it would be fun to sew this pattern in an oversized gingham or a pretty floral, but a solid would be fantastic as well! And what about an eyelet (broderie anglaise)? And of course stripes would be wonderful. Need some inspiration for this one? Here we go. You can see more photos and ideas in my B6661 Lisette for Butterick Pinterest folder. I hope you’ll have loads of fun sewing and wearing this dress! You can purchase the pattern right here. And please share your photos on Instagram with the hashtags #sewlisette and #B6661 so we can see how it turns out! I don’t know about you, but I’m a blazer girl. A good blazer can do so much for your wardrobe, and they’re not just for the corporate world. We’re not talking suits here, although I’m a big fan of a good suit and wore many back in my corporate days. I’m talking about the blazer as a wardrobe essential, the item that can transform anything worn with it. A blazer worn over a T-shirt and jeans looks so much more stylish and chic and elevates the entire outfit. Worn over a cute little floral dress it can add stylish warmth layer and also bring a little bit of masculine tailoring to a feminine style. It’s also a great seasonal transitional item! So here’s a little classic blazer with a twist for you. Introducing the new Lisette B6641 blazer pattern. This is a classic boy-cut blazer but with a turned-up collar that changes that whole notched-collar concept into something much more interesting and exciting while framing your face at the same time. And I know you’ll be excited to hear that this pattern includes princess seams and cup sizes so the challenges of getting a good fit are already handled for you. I like the darts, seams, and vent at the back, too. Isn’t it elegant? For fabrics, you’ll want to consider wool suiting (obviously) and flannel, denim or chambray, velvet or velveteen, cotton twill, gabardine, linen, brocade. So many options! You can pick up a copy of B6641 in the Oliver + S shop, and obviously I’m going to want to see how it turns out so tag it #sewlisette and #B6641 on Instagram so we can all admire, will you? And here’s the link to our Lisette for Butterick B6641 Pinterest board for these and more inspiration photos. Have fun with this one! This time of year, who doesn’t want an easy, comfortable knit dress to wear? I thought it would be nice to offer you something that’s both easy to wear and simple to fit. 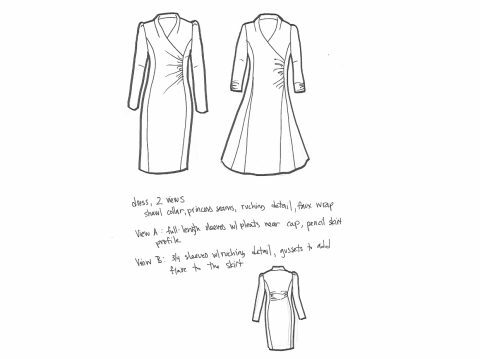 So our new Lisette B6626 dress pattern has separate cup sizes, which means that you’re one giant step closer to getting a great fit right away. The princess seams will get you even closer to a great fit since they’re easy to adjust as needed. This is one of those classic fit-and-flare dress styles that seems to suit everyone, you know? With the flared skirt and an invisible side zipper that allows you to get a close fit through the bodice, it’s the type of dress you can feel great wearing. And you can style it so many ways. Your choice of accessories will help you to get lots of wear out of this style because you can dress it up or keep it casual, however you prefer. You can also choose from two different lengths and two sleeve lengths. I especially like the back with the little cut-out and the bow detail. Think about using Jersey, ponte, and interlock for this pattern. You might also want to consider sewing the bodice and skirt from two different colors or prints if you want it to look more like separates. I can’t wait to see what you do with this pattern! Pick up your own copy of the pattern on the Oliver + S website. 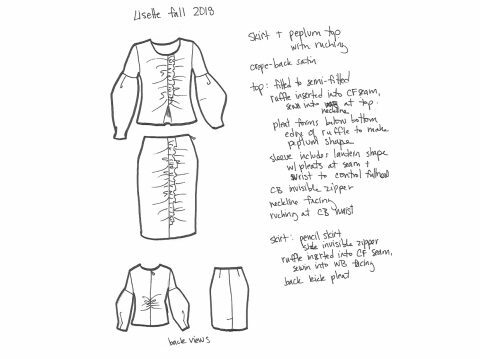 Then tag us with #sewlisette and #B6626 on Instagram so we can see how it turns out. And don’t miss our Lisette for Butterick B6626 Pinterest folder for more images. Today I’m happy to introduce you to the second of our new Lisette patterns for the season. This one is Lisette for Butterick B6598. 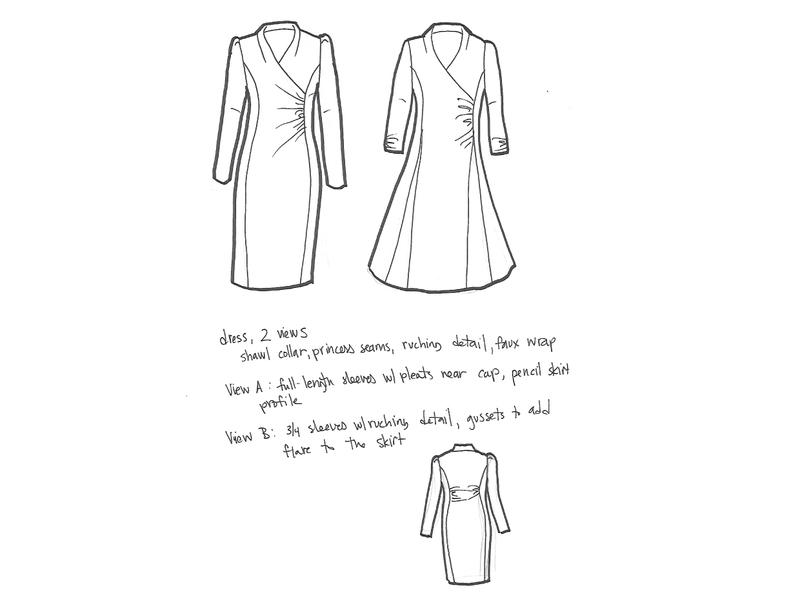 I was in London last year representing our Lisette patterns at a sewing show when I realized that we haven’t really done much in the way of fancy dresses–by which I mean dresses that might be worn to a more formal event, as opposed work or and every day apparel. If you’re like me you probably don’t attend all that many black tie events, but chances are good that you need a cocktail dress or a dress that might be worn for a wedding, etc. And as much as a skin-baring dress can be fun, I’m a firm believer that comfort equals confidence. And I don’t always feel comfortable (or confident) in a strapless number. Thus, this pattern. This is a two-piece pattern: top and skirt. Worn together they look like a dress, but they can also be worn as separates for more versatility. I love the shirring down the semi-fitted front, which also serves to help unify them when they’re worn together. Top View A is sleeveless and lined, while View B includes a front ruffle and fancy lantern sleeves (not too crazy or full, just interesting and fun) with a partial lining. Both views are semi-fitted with a pleated peplum detail that keeps the style playful and not too fitted. The skirt is fully lined as well. You’ll see that, in the end, we eliminated a few details from my original sketch. It started to feel too busy once all those details were included, but I’m really happy with the final result. For fabrics, we used crepe-back satin, but you could also choose wool crepe, a fancy jacquard, or a tweed or other textured fabric. Shantung or velvet could also be really pretty, don’t you think? I also love the idea of sewing it in a glen plaid or or other checked suiting and then pairing just the skirt with a denim shirt, for versatility outside the office. 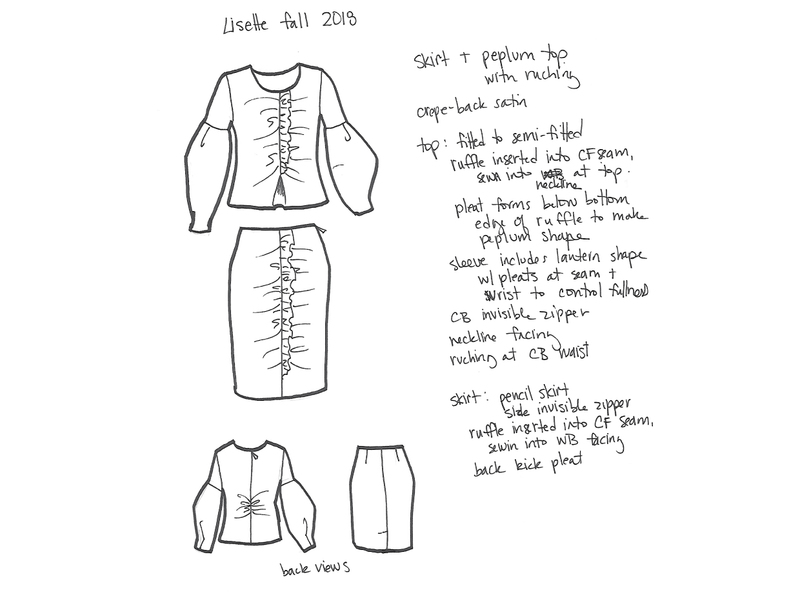 I’m really excited to sew and wear this one this fall. If you sew it be sure to tag it #sewlisette and #B6598, will you? And make sure to add your version to the Lisette Flickr group. 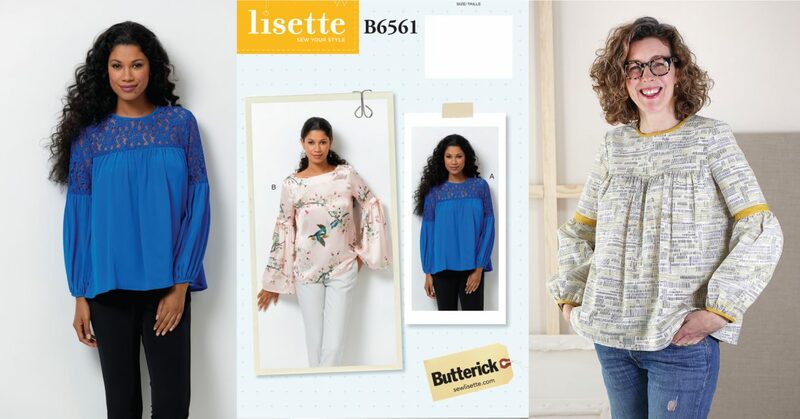 I’m happy to announce that our new season of Lisette patterns is now available from Butterick. I’ll be introducing you to the two new styles this week. Let’s start with this dress, Lisette for Butterick B6589. I’ll be honest with you. I was a bit disappointed when I saw the envelope cover for this style. This is a fitted dress, and it looked wonderful at the muslin stage. But it’s decidedly not fitted on the model used for the envelope photo. Apparently, at the photo shoot two different models wore it, and this model was much smaller than the other. So let’s overlook this photo for now and jump to the next, shall we? This is better, isn’t it? Let’s talk about the details. This is a mock-wrap dress with princess seams so you can get a good fit. It’s so much easier to adjust the fit when you have princess seams, so I like to include them in our patterns because they’re really helpful, especially if you’re less experienced with fitting or you vary between sizes. And they look pretty, too. In terms of fabrics, I would recommend crepe-backed satin (which is what we used for the dress in the photos), wool suiting (my favorite), wool crepe, or even velvet would work beautifully if you want to make it party-worthy. I’ll talk about that more below. Ponte and other stable knits would also work really well for this style. Here’s the full-length for both front and back. Even though the fit isn’t great on the model here, you can still see the details. This would be a great dress for work (if you’re a Suits fan, you know what I mean), but it would also be great for fancy parties or dinners out. I think it would be stunning in velvet as a holiday dress, don’t you? I hope you’ll have fun with this style! Be sure to tag it #sewlisette and #B6589 if you sew it, will you? And you can also post your photos to the Lisette Flickr group. As always, I can’t wait to see what you do with this style.